We are excited to welcome back Luke Chueh as he returns with his latest edition “Wish You Were Here” paying homage to the Pink Floyd classic. One of 1xRUN’s longest running artists, the prolific Chueh first joined us way back on RUN #00017 Inside Out. 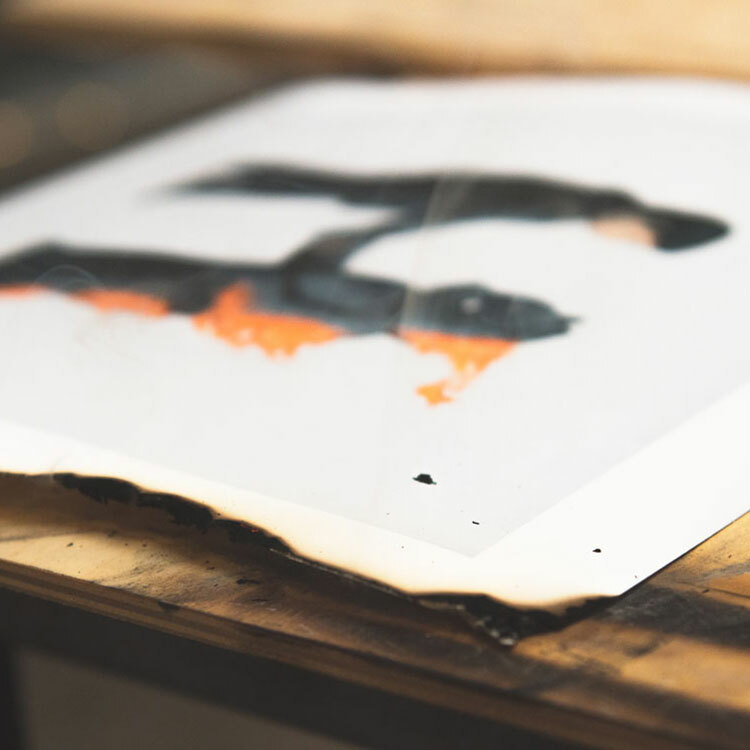 For this very special edition each print will feature unique hand applied burns making each one unique. 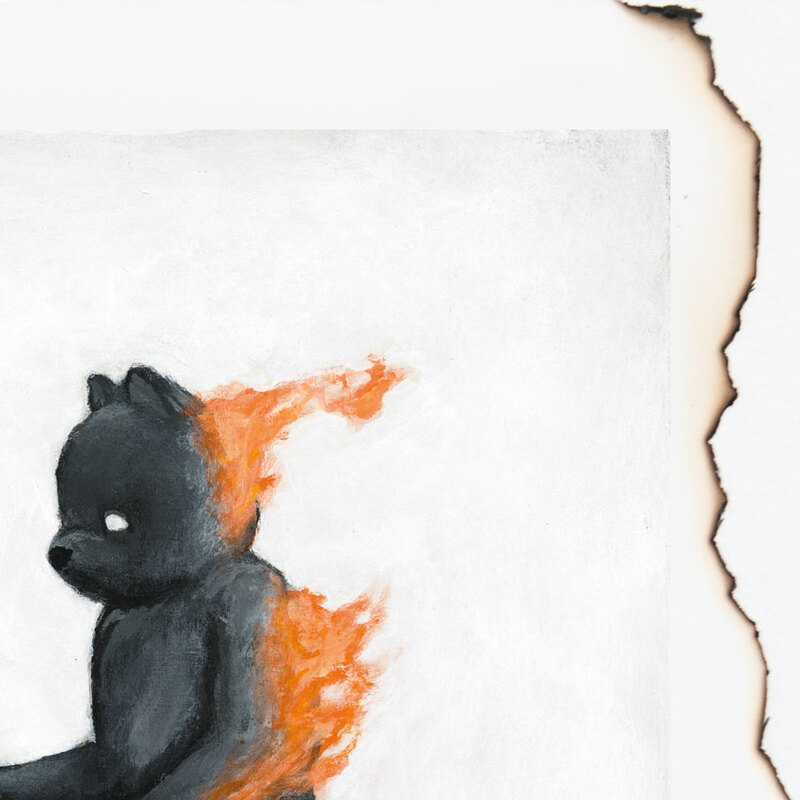 Read on as Luke Chueh gives us the background on his latest edition and much more . . .
1xRUN: Was this image part of a recent theme, series or show that you had? If so how did it fit into that given grouping? 1x: When was this piece created and what materials were used? Chueh: “Wish You Were Here” was painted with acrylic paint on wood panel in 2015. 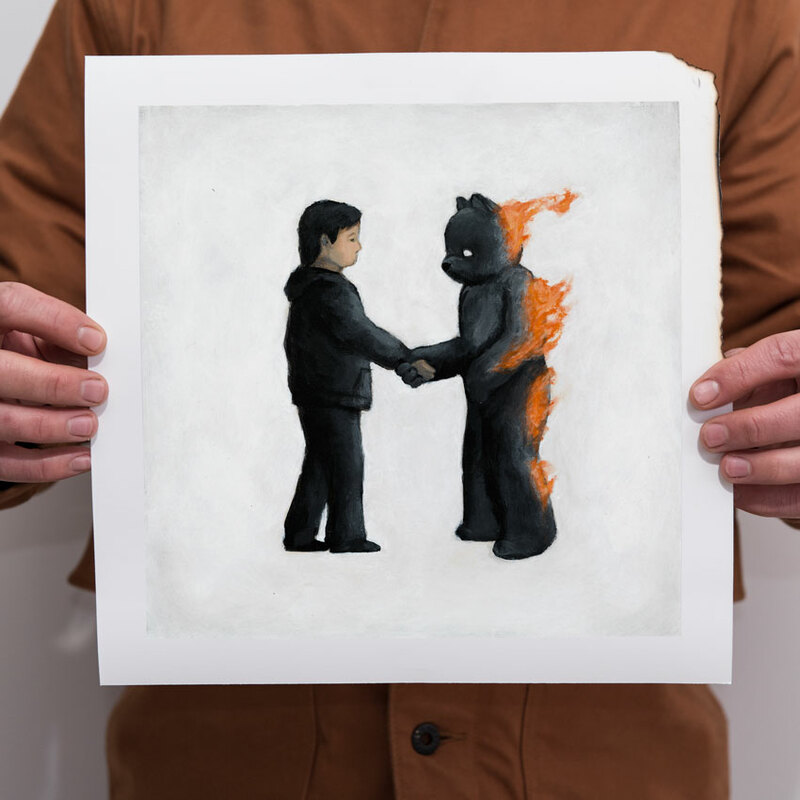 Chueh: For “Wish You Were Here”, I switched out the two characters from the original Pink Floyd photograph with my bear and I. I guess the painting is about the precarious relationship I have with my characters. Chueh: I think the painting took a couple weeks for me to finish. Chueh: I like to think “Wish You Were Here” is unique because it’s one of the first paintings I’ve created that didn’t feature a line, tracing the objects in the painting. Chueh: If you’re a fan of my work or a fan of Pink Floyd, I think “Wish You Were Here” would connect with you. 1x: It’s been a little bit since our last release with you, bring us up to speed on what you’ve been up to over the last year or so. Chueh: Since our last release I’ve been working on an animation project and some art collectibles with Munky King. Right now I’m working on my September solo show with Corey Helford Gallery. 1x: Any recent shows or exhibitions that you had? Chueh: My last show was in 2017 in the Philippines. My next exhibition will be in Shanghai this April, and my next solo will in Los Angeles at Corey Helford Gallery this September. Chueh: I’ve been exploring new techniques and narratives in my paintings. It’s been fun trying new things. Chueh: I’ve been experimenting with techniques I consider “impressionistic” in style. I think it’s forced me to improve as a painter. Chueh: it’s been a while since I bought anything. Money’s been tight.